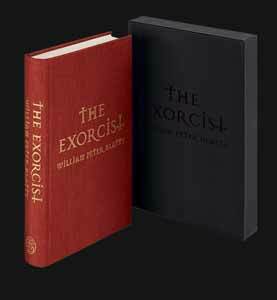 William Peter Blatty’s The Exorcist novel gets a brand new publication courtesy of the Folio Society. This format is a cloth-bound hardback set in Warnock Pro with Mason Serif display. There are 368 thick white pages, and 13 full page colour illustrations by Jeremy Caniglia. The book is presented in a Spot UV slipcase. This is a republication of the 2011 40th Anniversary Edition, which features certain refinements and additional material by the author. 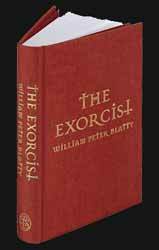 As Blatty admits, he was forced by the scriptwriting offer to rush his original ending. So this was his chance to put things right. Not that anyone noticed a lacking in its first release. It was a sensation and instant bestseller. As well as its expressive and graphic imagery this prose also emerged at a time that added to the overall impact. The end of the Summer of Love and the stark reality that was the Vietnam War woke up the populace to the fact that perhaps everything isn’t right with the world after all. The extra material includes a new character, but it doesn’t upset the balance. It’s in the form of a dream wherein a priest/demon appears to Father Karras. It’s creepy and somewhat surreal. I’m happy to report the effect of the book over the years hasn’t really lessened, as I feared it might. The only thing I would say is I couldn’t help picturing the film as I read it. This is unavoidable really; however, as the William Friedkin movie is one of the best ever made there is no real harm done. I’ve always respected well-constructed books to the point of obsession – particularly nice hardback collections. This example is a beauty. The materials are good quality, it feels relatively heavy in your hands, and the illustrations – sort of sepia effect photographs with an eerie otherworldly aspect to them – are perfect for the subject matter. A very nice release for genuine book lovers everywhere. A timely decision too, as The Exorcist stage play hits the West End of London.